Fingers crossed for another fine card-battler. Given the extraordinary success of Rage of Bahamut earlier this year, it's really not much of a surprise to see a steady stream of me-too titles flooding onto the App Store in its wake. The next to pop up for your attention is Square Enix's Guardian Cross, a game that's styled much more on the hands-off battling of Bahamut than, say, the cautious consideration of the stellar Magic 2013. 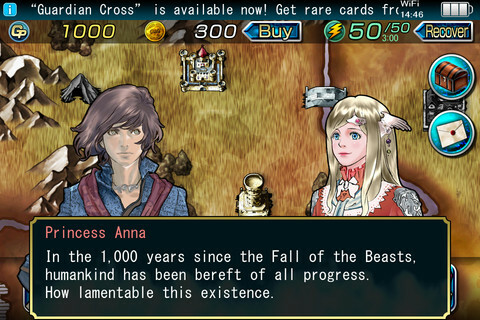 This being a game from the greatest of all JRPG powerhouses it should come as absolutely no surprise to see that the exquisitely drawn cards feature outlandish manga enemies, wide-eyed adventurers and straight-jawed heroes. It might seem strange to be talking about the interface so early on in a review, but the fact is Guardian Cross puts other card-battling titles to shame: no ugly wire frames, no dreadful loading screens, and a remarkable absence of the suspicion that you're actually trawling through a website circa 1995. This is a game that blends single-player adventuring with an arena-like multiplayer component, but before you can take on anything at all, you're going to need to hone a basic army out of very little. This is done through the hunting grounds of the game, where you take a sniper scope out onto a prairie range and bag as many beasts as you can within a daily, 60 second time limit. Once you've got your basic cards you're dispatched on various missions, delivered by your kingdom ruler. These might include clearing out a dungeon to retrieve some treasure, or simply exploring a town so you can get to know the locals through a friendly bout of card battling. As is so often the way in Square Enix games it's hard to tell where the tongue-in-cheek humor begins and where the mistranslation starts creeping in. As our brave hero begins his journey he asks the castle owner what exactly he should do to save the world. In response, and paraphrased, he's informed that he should probably complete missions in the order he's given them, and that they'll probably get tougher as time goes on. 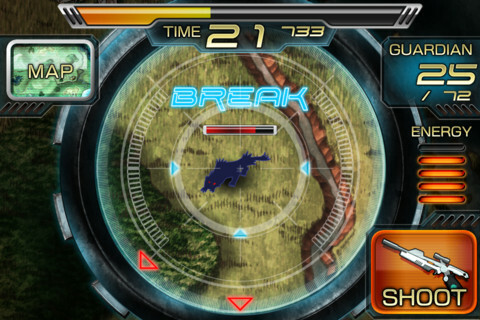 Unlike more tactical games such as Magic 2013, fighting is automated rather than carefully controlled on the fly. 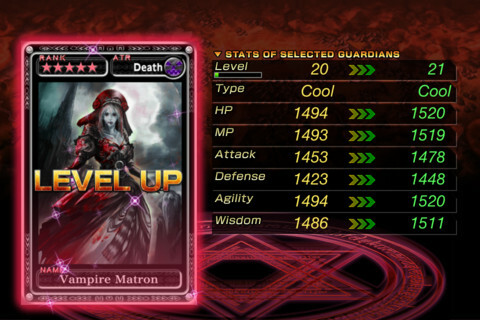 The skill in Guardian Cross therefore comes from maintaining a delicately balanced deck of cards, factoring in every damage and defensive type in order to build a truly unstoppable force. If your cards are lacking, then you can always feed any duplicate monsters you've looted into a preferred card to level the benefactor up and provide them with a very satisfying performance boost. You can also pick up Magic Stones during gameplay, and these give a hard stat boost to a character's health or attacking powers. All of this leads up to the game's Coliseum mode, the previously mentioned arena mode where you take your very best cards into multiplayer battle, facing off against real-world players to prove your worth across season-based play. 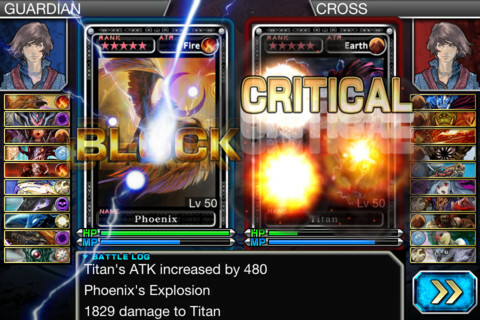 Sniper-shooting aside, Guardian Cross doesn't do a huge amount that's different to the many other card games on the App Store. But crucially, it's polished the experience to a hitherto unseen level of refinement in its art, interface and engagement. For that reason, anyone who got swept up in the Bahamut hype would be very well advised to get an early look at this pristine new title. What's Hot: A highly polished card battler, with some fresh gameplay twists. What's Not: Much of the core gameplay will be familiar to card game veterans.